EDIT: Giveaway is officially closed. Congratulations to the randomly chosen 36th commenter, Anne-Marie! Unless colorblind, you may have noticed the increase of pink products popping up in your everyday lives. That's because October is Breast Cancer Awareness Month! The amount of people supporting the cause is amazing. My favorite Mexican restaurant is even offering $2.99 pink margaritas on Mondays, and $1 of each sold benefits the Delaware Breast Cancer Coalition. Several crafters also donate to breast cancer research and programs, including all shops in my featured treasury of the week, PINK Charitable Donations. I leaped at the chance when Denise of Beaded Embellishments offered me the opportunity to spread the importance of routine breast exams for early detection. You may remember when I hosted her Swarovski Crystal Earrings Giveaway last October - she is a registered nurse at a chemotherapy unit so cancer awareness is a huge concern of hers. She uses her skills as a jewelry artist to help those that have been affected by cancer, and is giving away a piece for free. This pretty pink ribbon bracelet is strung with pink Swarovski pearls, frosted pink glass and silver metal spacer beads. It measures approximately 7.5 inches in length and closes with a silver metal lobster claw clasp. Giveaway is open worldwide to entrants at least 18 years old. I will be pulling a number from my random.org top hat after 11:59pm EST on October 25, 2011, and the corresponding commenter will win! Denise will contact that lucky soul for a mailing address. If she doesn't hear back from the winner within 3 days, a new number will be drawn. Mandatory Entry: Visit Susan G. Komen for the Cure's Understanding Breast Cancer page then comment on this post with a fact you learned. 2. Enter Denise's other Breast Cancer Awareness Giveaway and comment back here that you did. 3. Add one of Denise's breast cancer awareness accessories to your favorites AND heart her Etsy shop. Leave a comment with your Etsy username. 4. Like that same item by using the facebook like button on the right sidebar of Denise's Etsy listing and leave a comment here with the number of likes to the right of the button OR share it on your business page and include the link when commenting. 5. Like this giveaway on facebook by using the like button at the bottom of this post OR share it on your facebook business page and comment with the link. 6. Like Beaded Embellishments AND aquariann Art pages on facebook for one extra entry. Vote for my blog just by clicking Picket Fence Blogs. Like Beaded Embellishments AND aquariann Art pages on facebook for one extra entry. Enter Denise's other Breast Cancer Awareness Giveaway and comment back here that you did. mammography than with film mammography. 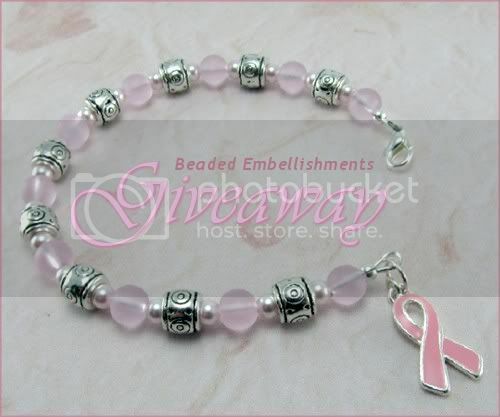 Entered Denise's other Breast Cancer Awareness Giveaway and comment back here that you did. Add one of Denise's breast cancer awareness accessories to your favorites AND heart her Etsy shop. Leave a comment with your Etsy username. I learned that out of every 100 cases of breast cancer 1 will occur in a man. I entered the other giveaway!! I added the Breast Cancer Awareness earrings to my favorites and hearted her shop on etsy! I liked this giveaway on facebook (same name) 7th like. If your 40 and older you should get a mammogram every year. I learned that if you have your period younger than 14, your risk of breast cancer is 20% higher than those who got it after the age of 14. I clicked the like Button on the bottom of the post. My name on FB is Laura Knudsen. I like Beaded Embellishments and aquariann Art on FB. My name on there is Laura Knudsen. I learned that although breast cancer is more common in women, it also occurs in men. I learned that Breast cancer in men is rare, but it is estimated that among U.S. men there will be 2,140 new cases of breast cancer. Because of the high hormone levels related to pregnancy, there has been concern that pregnancy after breast cancer could affect survival. However, the studies done to date show having a child after treatment does not lower a woman’s chances for long-term survival [82-84]. I learned that never having children is a risk factor for breast cancer. I liked the item on Facebook. I'm the first one to like this item. I learned that many factors are linked to breast cancer risk. Some factors affect risk a great deal and others by only a small amount. Some risk factors you can’t change. Simply being a woman and getting older increase your chances of getting breast cancer. Other factors you may be able to control. For example, leading a healthy lifestyle can help reduce your risk of breast cancer. I entered her other giveaway! chance of getting breast cancer...which is good because lumps are scary. vote You have just voted for aquariann! I learned the death rate is lower in men than women. voted. You have just voted for aquariann! White women are more likely to get breast cancer than any other racial or ethnic group. I entered the other breast cancer awareness giveaway. I learned that one out of a hundred cases of breast cancer will occur in a man. of lumpiness in their breasts, which is normal. Voted...You have just voted for aquariann! invasive breast cancer occurs when abnormal cells from inside the ducts or lobules break out into nearby breast tissue. an early stage when it is small and easier to treat. Mammogram images can be stored on film (standard) or on a computer (digital). I think my wife would like the BC Awareness bracelet with the silver ribbon. I FB liked the Breast Cancer Bracelet Awareness Pink Ribbon and I am the first to FB like it. If you have your period younger than 14, your risk of breast cancer is 20% higher than those who got it after the age of 14.
i visited and i learned that they have a section for clinical trials that may be very helpful! I learned that the older the woman gets, the more likely she is to get breast cancer.